There are many great things about being grown-up. You can stay up as late as you want. Drink cocktails. Have toast for tea every night. Sure, there are responsibilities. Like getting yourself to work on time, having a vague opinion on the new series of Homeland and figuring out how to iron fourteen shirts during one episode of The Great British Bake Off without missing a single second of baking telly brilliance. But one of the greatest benefits of being grown up is that you don't have to share your puddings and desserts. Heck, you can bake an entire cake and eat it all by yourself if you want. Yes, you may have to invest heavily in a regular supply of antacids but having a well stocked medicine cabinet is all part of being a grown-up too. You don't have to fervently watch as Mum carefully divides the Vienetta, ensuring neither your brother or sister have so much as a millimetre more of the creamy, chocolatey tempting ripples than you. You don't have to divide the pack of Smarties into three, heatedly arguing over who gets the orange ones. And the blue ones. Don't get me wrong, I know sharing is a nice. But sometimes in life doing a cake-selfie is okay too. 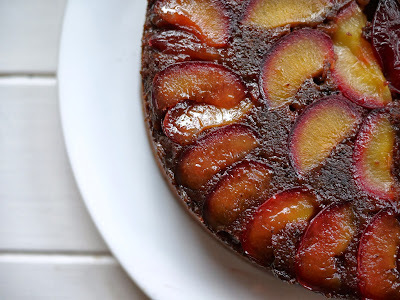 Especially if it is as tasty as this Chocolate and Plum Upside Down Cake. 1. Preheat the oven to 180C/350F/Gas Mark 4. Grease and line a 21 cm/ 8 inch deep, round cake tin. 2. Begin by preparing the plums: melt the butter in a pan. Stir in the sugar until the mixture is foamy and pale. 5. 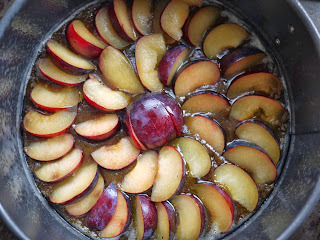 Spoon the cake mixture over the plums. Place the cake tin on a baking tray and bake for about 45 minutes or until a skewer inserted into the centre of the cake comes out clean. 6. Cool the cake initially on a wire rack for a few minutes before sliding a knife around the edge to loosen it. 7. Place a serving plate over the top of the cake tin and carefully invert onto the plate. Gently remove the tin and ... ta-dah! A lovely moist chocolate cake studded with delicious seasonal sweet plums! Anyway, I'm off to buy an entire Vienetta to eat ALL BY MYSELF. While warbling this song, of course. Chocolate with plums....yeh, that would be good. Great idea! Gotta try this. Thanks! Love any type of upside down cake! simply stunning!... it must be an upside down week eh? Love the chocolate a fruit combo too, very sweet... plus now we live so close there won't be many moment left for you to eat stuff by yourself! Lovely looking cake - the colours of the plums against the chocolate are divine. One of my brothers still eyes up all the plates just in case one is a bigger serving. And he's 27! Gorgeous looking cake, I would be tempted to keep it all to myself as well.